The heritage of Judson Tolnan is deeply rooted in the history of this great land of ours. His forebearers were a part of the colonization of New England. They fought in the struggle for American independence. The Tolman family were enthusiastic participants in the building of American institutions of freedom and democracy. Judson Tolman lived during a period when the young nation was expanding its frontiers westward. His parents, Nathan and Sarah Hewitt Tolman, moved from Kennebec County, Maine, in 1837 to Iowa. Judson was eleven years old when this move was made. He was born 14 Jul 1826, at Hope, Lincoln, Maine. Little is written about the family as it lived in Maine or in Iowa. Two significant events occurred in Iowa that had an impact on Judson's life. In 1844 his father died. In 1844 he made contact with the Mormon Church. Details of this event are difficult to find. Judson was impressed enough so that on the 12 Jan 1845 he was baptized a member of The Church of Jesus Christ of Latter-day Saints. From this date until his death he devoted himself to the cause of Mormonism, as it was his capacity to understand that cause. His faithfulness is reflected in his being ordained a Seventy in the Priesthood only three months after his baptism. Within a year he had moved to Nauvoo, Illinois, where the Mormons, under the dynamic leadership of Joseph Smith, had built a beautiful city. As a young man not yet twenty he met, fell in love with, and married Sarah Lucretia Holbrook (12 January 1846). She was the daughter of Joseph and Nancy Lampson Holbrook. In knowing the history of the Mormon Church it would be understood that these were trying times. The Prophet had been martyred in June, 1844. The body of the church was adjusting to new leadership. Persecution of every kind was being imposed upon them. They were forced by armed mobs to leave their homes with no more than horse and wagon could carry. Their Holy Temple was desecrated and destroyed. It was in the midst of these upheavals that Judson joined the church and married a choice daughter of Zion. One cannot help but wonder that these decisions were made with firm conviction in the rightness of Mormonism. Among those who know the Tolman breed it can be said that they are stalwart in following their convictions; whatever they may be. Within two weeks after his marriage Judson left Nauvoo without his bride to serve with the Hosea Stout Company in pioneering the route across Iowa to Council Bluffs. This was the vanguard group who prepared the way for the exodus of the Mormons from Nauvoo to eventually settle in Utah. He was employed in building bridges, roads, and in guarding the movement from its enemies. In the late spring of that year he returned to Nauvoo for his wife and moved in company with her father, Joseph Holbrook, to a temporary settlement at Winter Quarters. For over two years they struggled, sacrificed, and subsisted in an area that was then primarily a wilderness. As they traveled and endured these hardships they were "joyful" nonetheless. As a brief illustration of their courage and hope here is a statement from the journal of Joseph Holbrook: "April 20th (1847) traveled six miles and met my family with their wagon stuck in the mud on a small branch (stream) all alone. Found my family all well, almost out of bread stuff of every description and so had some corn meal for them. Judson Tolman, my son-in-law who had left me to return to his family had helped move my family with his own. He buried his only child, a daughter about two weeks old, two or three days before at the burying grounds on the bluffs near Punkas, where about twenty-three of our brethren and sisters had been buried during our short stay in that place. Yet in all our tribulations, we felt joyful." Wherever they were, for even a short stay, they applied themselves to their tasks as if it were a permanent location. Always planting crops, always making homes, always industrious in providing for the needs of their families; never losing faith, never giving up hope. Although Judson Tolman and Joseph Holbrook were ready to begin the trek to Utah in late 1847, they were encouraged to wait until the spring of 1848 to make the trip. It was no doubt wisdom on the part of Brigham Young that an advanced party establish a colony first before families were brought to Utah. 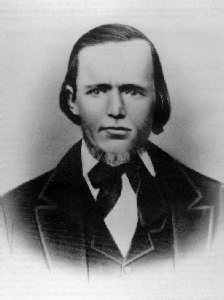 A year later on the 20 Sep 1848 Judson Tolman arrived in Salt Lake Valley as a member of the Brigham Young Company and the Daniel Garn Fifty. He was in company with his two brothers, Cyrus and Benjamin, and the Joseph Holbrook family. The first winter in the valley was described by Alice Leone Patterson Wilkinson in her history of Judson Tolman as follows: "Judson Tolman's first home here was a little dugout in the Ninth Ward. A great many hardships had to be borne that winter on account of the scarcity of crops. They were obliged to live for six weeks on nothing but wild onions and milk. The next year the crops were very successful. From one peck of seed received from the pioneers, he raised twenty-five bushels of potatoes. About the first of July the first barley was ripe and they ground it and made bread, the first they had had for a long time. In July 1849 Judson left Salt Lake City and located in Bountiful, Davis County, having asked for the privilege of taking up a farm, he built a house there." In his own words here is a description of his activities in these early days of Utah. This account also comes from Leone Willcinson's history of Judson Tolman. "I helped to fight the crickets in 1849 and that year, together with two other families, settled in Tooele, Utah. We were the first settlers there. In 1850 I was one of a company of thirty-one called by Brigham Young to serve as guard on the Southwestern frontiers of Utah, under Captain Phineus White. I served three and one-half years in that capacity and was in battles with the Indians where 16 Indians and one white man were killed. In 1852 the Indians took the last yoke of oxen and cow I had. In the fall of 1854 1 moved to Bountiful Utah." Judson went to Tooele with Josiah Call and Samuel Meacham. He is credited with having built a sawmill in the Tooele area. His movement to Bountiful was apparently encouraged by the loss of much of his goods to the Indians. His home for the rest of his life was in Bountiful. His occupational pursuits were in farming and lumbering. He built and operated four or five sawmills in the vicinity of Bountiful. The chronicles of Utah are filled with exciting events of a people struggling with the elements of the barren desert to make it a productive and habitable place in which to live. To realize that our ancestors were active participants in these events magnifies our interest in the History of Utah. Heber C. Kimball prophesied that goods would be had cheaply and in abundance in the Salt Lake Valley. This prophesy was fulfilled when the Gold Rush to California in 1849 brought people through Utah in great numbers. Judson Tolman records that he witnessed this condition by selling an Indian pony for a one-hundred dollar wagon and harness. He saw his crops threatened by grasshoppers and describes a simple technique as a remedy. Two men stretching a long rope across a field would move it along frightening the insects off the field into the Great Salt Lake where the grasshopper would die. Part of the crop could be preserved in this way. He speaks of "Uncle Sam's Army," a reference to the coming of Johnston's army to Utah. On this occasion he moved his family to Provo and stood with the Saints, ready to put to the torch all his earthy possessions to prevent their falling into the hands of an invading Army. Judson Tolman was a leader in his church duties. He was ordained a Seventy in June 1846. A singular honor for one so soon a member of the church. He accepted the principle of plural marriage, as a divine law. So completely and sincerely did he involve himself in the practice of this law that he neglected to heed the voice of the prophet when the Lord counter-maned its application. In 1877, when fifty years of age, he accepted a call to serve as a missionary in his native Maine. This interesting account of a missionary experience reflects the nature of his personality. Here again we quote from the Leone Wilkinson History. "Like most missionaries his enemies tried to overcome him, but he was always gifted with a ready answer. Once a sectarian minister after having railed the Mormons uselessly, finally said, "Well what about the Mountain Meadow Massacre? You can't uphold your people there." Brother Tolman answered, "I will take a Yankee's privilege and answer you by asking another question. Do you remember the Haun's Mill Massacre? It was mostly Methodists who did that work. Are you going to blame the Methodists for that, or the men who did it?" The minister answered, "Why the men who did it, of course." Then, said Brother Tolman, "be as lenient to the poor deluded Mormons." In 1885 Judson was ordained a high Priest, and ten years later a Patriarch. He is said to have given over two thousand Patriarchal Blessings. His spiritual stature is projected in this record. "He has witnessed a great many spiritual manifestations in his life, he has had many visions and lived to see some of them fulfilled. At one time he was permitted to visit the spirit-world and he says that, with his spiritual eyes, his sight was not confined to objects near at hand as with the natural eye, and that he moved much more rapidly than by natural walking. He saw there a sea of glass upon which walked spirits (he supposed they were spirits) two and two clasped in each other's arms, and tongue cannot express how beautiful they were. It impressed him how careful mortal man should be to merit the purity that he possessed before coming here." Again from the Leone Wilkinson History. The most perplexing part of Judson Tolman's life for us to understand is his practice of polygamy. Survival in this pioneer age required a rugged and an independent spirit. Judson Tolman mirrored the cause of the church as it related to plural marriage. I would not argue that he was not sincere and devout in his belief. That he was fallible and human seems obvious. It will do us honor to view his history with the tolerance of a loving generation who would withhold judgement. Certainly there is reason for this. We admit that all the facts are not easily identified. Let us review what we know as generously as possible. Sarah Lucretia Holbrook was Judson's first wife. These two suffered, sacrificed, and rejoiced in their life together. They had fourteen children in twenty-three years. The rigors of child-bearing in this pioneer setting no doubt shortened Sarah Lucretia's life. She died in 1869. Judson's second wife was Mary Peeves Coleman. They were married in 1852. 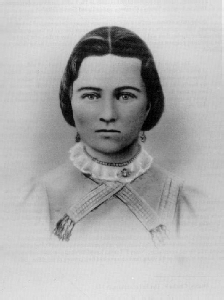 Mary was the widow of George Coleman who had lost his life in the Mormon Battalion. Of Judson's and Mary's lives together we know nothing. No record of children has been found. There is a church record that the marriage was canceled on the 26th of January, 1857. But beyond this no information has been uncovered. This relationship is one of interest, but hardly speculation. In 1856 Judson married Sophia Merrell. There is some question as to the compatibility of this union. They had four children. In 1869 Sophia left the home in Bountiful and moved to Plymouth, Cache County, Utah. Records indicate that this marriage was canceled by the church in 1869 and again in 1874. No reason is known. Sophia remarried Garret Hopkins Wolverton. She died in childbirth in 1875. The cancellation of the marriage of Judson and Sophia may be coincident with a visit that Sophia Merrell paid Brigham Young in 1869. We may conclude that a divorce was granted as a consequence of what took place at this visit. Judson's fourth wife was Zibiah Jane Stoker, a young lady who came to fill the void left by the loss of Sarah Lucretia. Not only did she mother the older family, some of whom were older than she was, but she bore Judson eleven children of her own. Her home was remembered by the grandchildren as one in which you were always welcome. She was a generous and loving wife and mother. In our day it is difficult for us to conceive of a girl assuming so much responsibility at the tender year of fourteen. She lived to see both families raised. She outlived her husband ten years. She was, apparently, the heir to Judson's books and personal journal. Today we would like very much to ask, "What became of this valuable record?" The practice of polygamy was officially abolished by the Church in the Woodruff Manifesto of 1890. The problems this created can be readily understood. Those who were members of these families could not abandon this relationship without serious hardship. It took a generation for the practice to die out. There were some in the Church that did not accept the Manifesto. Some of the venerable brethren continued to perform plural marriages. By 1903 President Joseph F. Smith of the L.D.S. Church issued a decree that the practice must stop, and that examples would be made of men who persisted in defying the Manifesto. Excommunication became the consequence to several who refused to accept the revocation of what to them was an eternal principle. This became the fate ofJudson Tolman. On the 3rd of October in 1910 Judson Tolman lost his most precious possession: his membership in The Church of Jesus Christ of Latter-day Saints. He was charged with performing plural marriages, for marrying illegally himself, and for lying about it. This is a matter of record in the Historical Record Book A 1909 to 1919, of the Bountiful First Ward, Davis Stake. A strange thing is that this information comes to our generation as a surprise and a shock. This surely must have been known by the children and grand-children of Judson Tolman. What also seems apparent is that it was not accepted by them. The record of the trial of Judson Tolman is not available for study and analysis. From the outline of the reasons of excommunication he apparently performed plural marriages contrary to instructions. Then we find a record of temple sealing in which the children of Eleanor Odd William were sealed to Judson Tolman. This was in 1908. We must then conclude that Judson and Mrs. Williams were married sometime between 1904 and 1908. In 1904 Judson was seventy-eight years old. We have not been able to find a record of this marriage. We must conclude that these illegal marriages were performed secretly, without public or church record. Since Judson was charged with having married illegally it seems that the illegal wife was Mrs. Williams. These facts are few but they seem irrefutable. As members of the family who can remember this period are confronted with these facts they remember things which give support to the projection that Judson and Mrs. Williams lived together as man and wife. As to the "lying" we don't know. It seems feasible that at the trial Judson would have been asked about the marriages performed by him as well as the Mrs. Williams affair. Perhaps the information he gave involving the people and events associated with these marriages amounted to an untruth. The limitation of not having more facts leaves us frustrated and only able to make incomplete suppositions. Another interesting record has been discovered. On the 14th of February 1912 Judson was baptized by his son, Jaren Tolman; and confirmed a member of the Church by Joseph H. Grant, Davis Stake President. This not only confirms his excommunication, it reflects a desire to be re-fellowshipped in the Church. Though he was known until his death as Patriarch Tolman, he never regained the blessings of the priesthood which he had once enjoyed. He died 6 July 1916. Funeral services were held in the Bountiful (Davis Stake) Tabernacle 9 July 1916, a short week before his ninetieth birthday. Thousands live to revere the name of Judson Tolman. Special request was made to have his temple blessings restored to no avail until 1981. Knowing the respect and love in which this man was held by his peers it seemed only just that one day he would receive the reward of the faithful; that he should not be eternally punished for being a child of his time. Through the efforts of various cousins, the restoration of Judson's priesthood blessings was accomplished 24 Sep 1981 (see Judson Tolman: Pioneer, Lumberman, Patriarch, by E. Dennis Tolman, available from the Thomas Tolman Family Genealogical Center, for more detail). Source: "Thomas Tolman Family Magazine," (Bountiful, Utah: Thomas Tolman Family Organization, December 1997), 12-16. Printed originally in Vol. I First Quarter 1965-28 - with revisions.